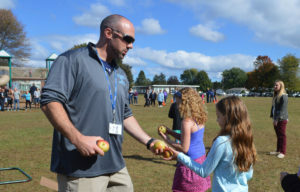 Physical Education teacher Greg Jette gives out apples to students following the 2017 Green Meadow Apple Race. Green Meadow’s annual Apple Race is scheduled for Thursday, October 11 at the field behind school. Awards will be given out immediately after each race and every student will receive an apple. All parents and friends are welcome to attend this fun event. You do NOT need to sign in; please go directly to the outside field.